Brighten up your event with colorful crayons and a great big smile! The Smiley Crayon Slide Combo is recommended for ages 3 and up. It includes a spacious bounce area, a climb wall with pop-outs and handles to the top of the 12ft slide. Netting at the top of the slide prevents over eager little ones from jumping. A bumper at the bottom will catch you outside of the bounce area. The inflatable entrance ramp assists little ones as they enter and exit. The high visibility mesh allows you to keep an eye all of the fun. As always, our inflatables are safe and secure because they are made with lead free & fire-resistant vinyl and include a safety exit. Please note, this unit can only be used dry. 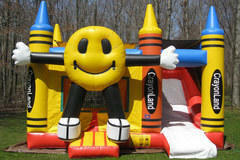 There will be no shortage of smiles around this combo bounce house!